This is one that came recommended by Seb -- and with good reason, I’ve learned. 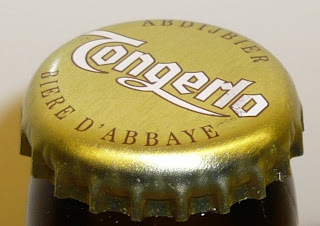 Tongerlo is an abbey beer, produced by the Haacht Brewery under license from the Tongerlo Abbey. I’ve got the dark brown double in front of me tonight. I haven’t always been impressed with abbey beers. These are not like the Trappist brands, which are always made at the monastery under supervision of the monks. The abbey beers are made by commercial enterprises that have a connection to a monastic community, brewing beer under their name in exchange for some donation to the group. So, it can be a bit hit-or-miss. Some abbey beers, like Corsendonk pater, Floreffe Dubbel and Maredsous 8° Brune, are very high quality, but others, like the Grimbergen range, have not impressed me at all. 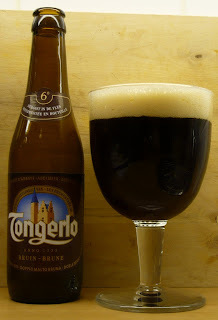 Tongerlo Dubbel Bruin 6° easily falls into the former group. It pours very dark and inviting, with a creamy head like an Achel Brune, though the liquid itself is not quite as viscous. The taste is rich but not too sweet, with a pillowy mouth-feel. Roasted malt, nutty, chocolate... very nice mix, including the 6% alcohol. Nothing jumps out so much here to throw the flavours off balance. This is a beer I will come back to. It is actually quite common in pubs in Brussels, and I think it even comes on tap. I did indeed recommend it to you Andrew. For the meat eaters in the room, I would also recommend the Beef Tongerloo served at the 1898 on Auderghem, near Rond Point Schuman. The dish was recommended to me by Nicholas, the pal who shared Westmale dubbel with Andrew. Anyway, I'm sitting here in my couch, in Abidjan, having a French Canadian 'Fin du Monde' which is for the record the closest you can get in this city to a Belgian beer.